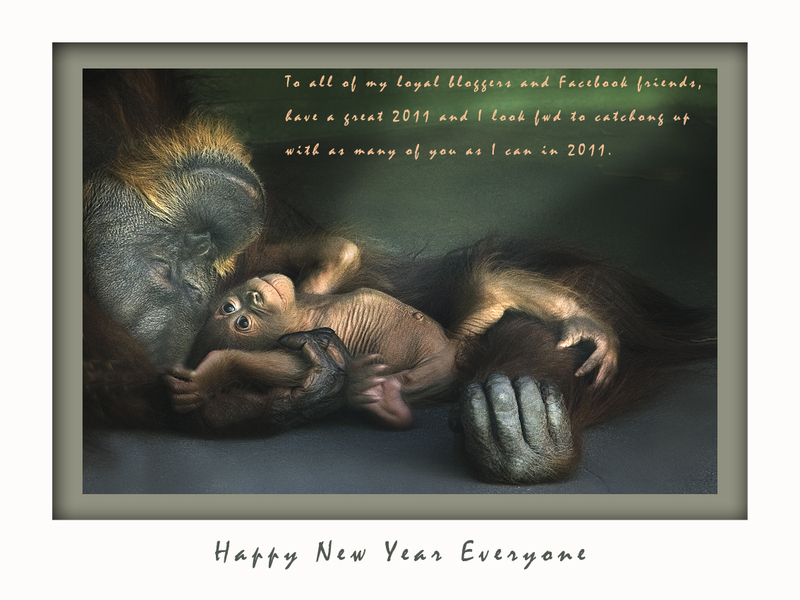 Graham Leggette made comment a while ago that he rated this Orangutang shot of mine as one of the better shots of 2010, so I thought I would post it as a happy new year image to both celebrate the passing of 2010..phew…and welcome in 2011. 2010 for me has had a number of challenges, but we have managed to rise to all of them, but I am kinda looking fwd to 2011 all the same! My blog is now approaching 100,000 hits and in the new year Flemming Bo Jensen, alias Bomont, Bomontaruny, Mr. Bo Jangles and Flembot is going to put together a website for me to be able to sell images on line. So next year is going to take my photography to a new level and I welcome that challenge. Thanks for the assistance Flembot! Thanks also to my little buddies Christian and Mike Fletcher for all their support last year. I always enjoy our adventures and there will be many more to come I am sure! A special mention to Brent Pearson also for his tutoring and advice with off camera flash etc, thanks mate. Thanks also to Tony Hewitt and Peter Eastway for their tutoring at Karijini. And last but not least are the bloggers…yep you guys out there. It is a very strong community that has risen to the occasion a couple of times this year to assist other bloggers. The community will only get stronger as the numbers grow and with additional people coming into the community so will additional benefits and ideas. It was great to see a heap of you on board the True North last Australia Day and hopefully we will get to see you all again this year, with perhaps a mix of new players. It will be a great day with a number of prizes on offer thanks to Team Digital and Rodney Thomas and his new rip stop bag. Rodney the man himself is flying over specially for the event so come along and meet the man and find out why these bags are setting new stds in camera bags! So enjoy tomorrow evening and bring on 2011 I say! ~ by True North Mark on December 30, 2010. Mark, magnificent images you have sent us all year long. I’d really like Y O U.to be amongst the presenters on T. N’s Australia Day big day out. That is probably the best comment I have ever had mate…so a very nice way to finish the year off. I might think about a guest apperance on the day maybe! See you on Australia Day! Gidday Mark…how’s my favorite gabby going and where are you these days mate? I’m down south next week, think bomont is too. WIll you be down? Should all catch up for a shoot to kick off the new year! I have to work next week mate and then back at Rotto next weekend. Happy New Year Mark, all the best! Thanks for the comments Dave and Chizzy! That’s a big 10-4there Neal…I am looking fwd to that Cervantes gig in the new year! Hey mate, thanks for the awesome adventures in 2010 and happy new year, we shall make 2011 the year that will be remembered for the launch of the True North Mark Photography website, the launch will rival that of the Apollo 11 mission (well, almost hehe). I made it down South to Christian and Jen and loving being here (although it is FRIGGING cold here hehe. Gotta toughen up!) Have a great one, see you soon! Yep bigger than Ben Hur as they used to say back in the day! Give Christian Jen a big cuddle from me for NYE…and then give yourself one mate! Happy New Year Mark. This is indeed one of the best shots to be found in blog land. Did you have any luck with zoo using this one? No mate..they just said they’d put it on file and let me know if they needed it! They also reminded me that I weren’t allowed to use it commercially without their permission! Happy New Year Mark from Walpole !! Must see if I can catch up with flemming in a couple of days when we get to Busso. Happy new year to you to Mervy boy from Rotto! Happy new year Mark. Definitely one of your best images, but some many other good ones. Having an awesome time on the TN. All the best for 2011 mate, look forward to seeing the adventures ahead and the big launch. You have been a regular for sure! That image is Gold, Mark! All the best for the coming year! Happy New Year! Thanks for all the blogs in 2010….I’m shooting Southbound at the moment but will be updating for 2011 when I get back (It’s bloody bot here!!) Hope 2011 brings everything you wish for and looking forward to more ”True North Mark blogs in 2011!! Thanks Sandy…good luck with Southbound! Fantastic image Mark… still love it. BTW, Happy New Year! All the best for 2011. Thanks for all the comments Graham…yep it was your comment that prompted me to use the orangutan shot so thanks for that! I wish you and your family all the best for 2011 and beyond mate. It was great catching up and cruising about with you (and the other guys) for a few days in 2010 and hopefully we can do more of it in the future. Also thanks for your friendship and support ! You are most welcome Toneman!